We will find an aircraft for you too! Currently, Ethan Malavolti is authorized by the FAA to conduct Sport Pilot, Private Pilot, Instrument Pilot, Commercial Pilot, Multi-Engine, and Certified Flight Instructor flight exams in the Indianapolis FSDO service area. 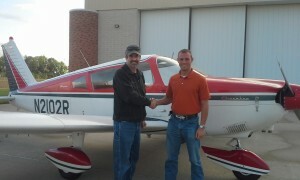 To inquire about a check ride, please contact us to schedule your flight exam with Ethan today!